1. Aquatic therapy: activities like swimming or water aerobics are great low-impact ways to increase flexibility and strength. Water therapy has been proven to reduce pain and improve physical function. It’s often recommended by physical therapists when treating patients suffering from joint injuries or recovering from joint surgery. 2. Acupuncture: You may be skeptical of holistic treatment methods, but if you aren’t afraid of needles it may be worth a shot. Research has shown that acupuncture may relieve pain by as much as 50%. 3. Capsaicin: Available in over-the-counter topical creams and ointments, capsaicin is the substance responsible for the heat in hot peppers. Studies suggest that it redirects nerves so you don’t feel pain in the joint. 4. Supplements: Glucosamine and chondroitin sulfate supplements are commonly used to treat the pain and swelling resulting from osteoarthritis. Additionally, fish oil supplements have been proven to effective as an anti-inflammatory. Taking natural supplements may help you achieve sore joint relief. It’s best to consult a physician for recommendations prior to taking supplements. This is especially important if you are also taking prescription medication to prevent adverse interactions. 5. Wrap (or Tape) it up: Wrapping a joint with an ace bandage wearing a brace can decrease swelling and help relieve pain and stiffness. In recent years, kinesiology tape has also grown in mainstream popularity, but if you have never applied it before you should consult a physician or physical therapist first to make sure you are applying it correctly. 6. Cryotherapy: Heating pads or cold compresses are nothing new when it comes to relieving achy joints, but cryotherapy is becoming more widely available throughout the United States. Cold temperatures reduce blood flow, which in turn reduces tissue swelling. Ask your physician if a cryotherapy chamber may be an effective option for you, and whether he or she has a recommendation for a reputable facility in your area. 7. Keep a food journal: For some people, certain foods like red meat or dairy may trigger joint inflammation. Keep a food journal of what you consume each day along with how you feel. When you experience symptoms, try eliminating the foods that may have caused you to feel that way. This practice can also help with overall nutrition and weight management which can provide relief for weight-bearing joints like your knees. 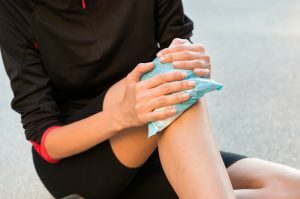 While these methods can help you achieve sore joint relief, or in some cases even prevent its frequency of recurrence, the most important thing you can do it understand the root of the problem. If you are suffering from chronic joint pain, the medical professionals at South Shore Orthopedics can help. Call 781-337-5555 or schedule an appointment online with one of our expert physicians today.